Despite warnings of fetal alcohol syndrome, pregnant women are still putting bottle to mouth and binge drinking in the first trimester of pregnancy, according to the Substance Abuse and Mental Health Services Administration (SAMHSA). Information used in the report was collected as part of the National Survey on Drug Use and Health in 2011 and 2012. The survey included more than 67,000 people. Fetal alcohol syndrome (FAS) is characterized as a list of physical and cognitive side effects associated with alcohol consumption during pregnancy. No amount of alcohol consumption is safe during pregnancy, according to SAMHSA, and drinking more increases the risk of FAS. 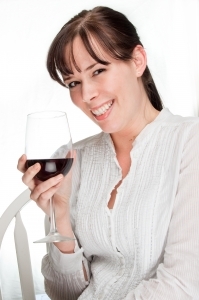 According to the data collected about 18% of pregnant women report drinking alcohol in the first trimester. Of those 18%, slightly less than 7% report binge drinking on at least one occasion. As the pregnancies progressed to the second and third trimesters, women tended to drink less with sharp declines in overall alcohol consumption and binge drinking, but drinking was reported in 4.2% of women in the second trimester and 3.7% of women in the third trimester. Binge drinking was also reported in 1.1% of women in the second trimester and 0.4% of women in the third trimester. There is little doubt women understand the potential risks associated with drinking, as evidenced by the decrease in overall and binge drinking, but why do women consider first trimester drinking okay, but drinking in later stages of the pregnancy a problem? The change could have something to do with the physical progression of the pregnancy. In the first trimester there is no pregnancy show, so unless the women tells someone she is pregnant no one will be the wiser. By the second trimester, pregnancy show starts and continues until the end of the pregnancy. As the pregnancy becomes more evident women may feel more guilt about drinking and thus curb alcohol consumption. Experts believe some women may be missed some key pieces of education in terms of first trimester alcohol consumption and risk of FAS and other complications. Source: "Results from the 2012 National Survey on Drug Use and Health: Summary of National Findings and Detailed Tables." The Substance Abuse and Mental Health Services Administration. N.p., n.d. Web. 12 Sept. 2013.